About the Piece: The pack incited us to soar with it, among the distant peaks. It was instinct that called for us to go, to joyously run headlong through the snow. “The Pack” is an offering of gratitude to the first exquisite dusting of snow and an acknowledgement of the elegance in our relationship with nature. Above all, it celebrates our companions, our families, our packs. About the Artist: Megan Marie Myers is a painter, illustrator, and native Oregonian. Her painting studio is walking distance from downtown Bend. When she is not painting, she is exploring the Oregon outback. The characters in her work roam through Oregon landscapes, inspired by our region’s mountains, forests, deserts, rock formations, and rivers. Myers typically features children and animals as her central figures. Her intention is to represent the limitless sense of wonder, the yearning to explore, and the resilience that each of us carry within. 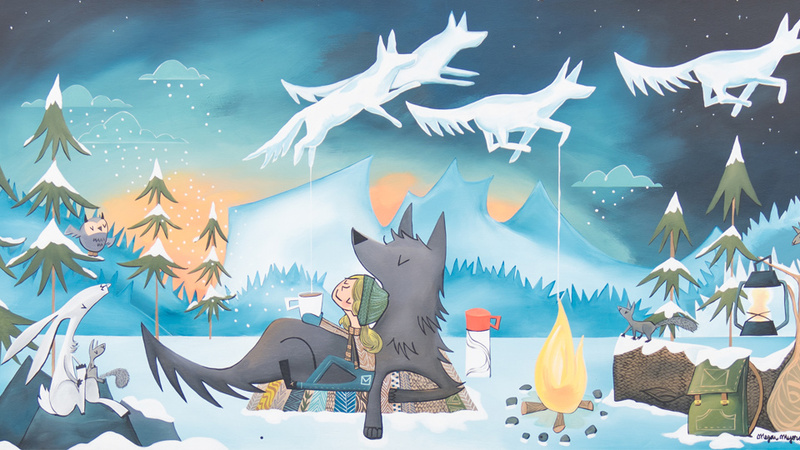 Her paintings explore themes of companionship, protection, wilderness, and the greatest adventure of all, love.